Here is the weekly review of the top performing New Zealand players, who play currently abroad. #1. This week's number one is former international power forward Steven Adams (213-93, college: Pittsburgh, currently plays in NBA). He led Oklahoma City Thunder to a victory against the New Orleans Pelicans (23-29) 122-116 in the NBA in Thursday night's game. Adams had a double-double by scoring 20 points and getting 13 rebounds in 36 minutes on the court. The Oklahoma City Thunder has a solid 32-18 record this season. It was his team's sixth consecutive victory in a row. It's Adams' sixth year with the team. He has individually a very good season with high stats. Adams averages: 15.4ppg, 10.0rpg, 1.8apg, 1.5spg, 2FGP: 61.5%(311-506) and FT: 55.6% in 48 games he played so far. He played for the New Zealand senior national team eight years ago. #2. Second place goes to an international forward Finn Delany (198-95, college: SW Baptist, currently plays in Australia). Delany contributed to a New Zealand Breakers' victory against the closely-ranked Bullets (12-11) 109-96 in the Australian NBL on Sunday night. He scored 17 points, had 4 rebounds and dished 5 assists in 24 minutes. New Zealand Breakers (10-12) are placed second from the bottom (#7) in the NBL. This year Delany's overall stats are: 7.2ppg, 2.7rpg, 1.1apg, 2FGP: 66.7%(42-63), 3FGP: 37.5% and FT: 65.8% in 19 games. He is in the roster of the New Zealand senior national team. #3. The New Zealand player who performed third best last week abroad was an international swingman Reuben Te Rangi (198-94, currently plays in Australia) faced previously mentioned Finn Delany in the Australian NBL last game. Te Rangi. He could not help Bullets (12-11) in their last game on Sunday. Despite Te Rangi's good performance Bullets were defeated 109-96 on the road by the one of league's weakest teams New Zealand Breakers (#7). He scored 14 points and grabbed 7 rebounds. Te Rangi has relatively good stats this season: 11.6ppg, 3.3rpg, 1.3apg, 2FGP: 45.9%, 3FGP: 47.6%(50-105) and FT: 68.4%. He is also a member of the New Zealand senior national team. #4. Guard Corey Webster (188-88, agency: Alti Sport, college: Lambuth, currently plays in Australia) is a teammate of previously mentioned Finn Delany and both played together in the last Australian NBL game. Webster helped New Zealand Breakers win their game against the closely-ranked Bullets (12-11) 109-96. He scored 10 points and added 3 assists. This season Webster has relatively solid stats: 10.6ppg, 2.0rpg and 2.4apg. He is also New Zealand national team player. #5. International guard Shea Ili (184-92, currently plays in Australia) is a teammate of previously mentioned Finn Delany. But that was another game of his team in Australian NBL which we would like to mention. Ili helped New Zealand Breakers win their game against the league outsider Cairns Taipans (4-19) 113-106. He scored 11 points in a mere 17 minutes. New Zealand Breakers (10-12) are placed second from the bottom (#7) in the NBL. 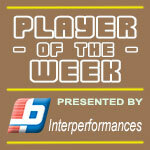 This year Ili's total stats are: 7.5ppg, 2.5rpg and 2.6apg in 21 games. He plays currently for the New Zealand national team. #6. An experienced guard Jarrod Kenny (188-85, currently plays in Australia) faced previously mentioned Shea Ili in the Australian NBL last game. Kenny was not able to help one of league's weakest teams Cairns Taipans in their game against New Zealand Breakers (10-12). He scored 6 points, had 4 boards, passed 3 assists and added 3 steals. The bottom-ranked Cairns Taipans were defeated 113-106 in Auckland by the one of league's weakest teams New Zealand Breakers (#7). Kenny has averaged so far 3.9ppg, 2.0rpg and 1.7apg. He is an international player who is currently on the senior New Zealand National Team roster. #7. International forward Mika Vukona (197-82, currently plays in Australia) is a teammate of previously mentioned Reuben Te Rangi and both played together in the last Australian NBL game. Vukona was not able to secure a victory for Bullets (12-11) in their game against New Zealand Breakers (10-12). He scored 7 points and grabbed 5 rebounds in 16 minutes. Bullets lost 96-109 in Auckland to the one of league's weakest teams (#7) New Zealand Breakers. Vukona has averaged so far 6.6ppg, 4.3rpg and 2.0apg in 22 games. He is also New Zealand national team player. #8. Center Alex Pledger (215-87, college: Belm.Abbey, currently plays in Australia) helped United win their game against the closely-ranked Adelaide 36ers (12-12) crushing them 114-91 in the Australian NBL last Monday. Pledger scored 8 points in only 13 minutes. Melbourne United (14-8) is placed second in the NBL. Pledger has averaged so far 6.7ppg and 5.1rpg in 21 games. He plays currently for the New Zealand national team. #9. Former U19 international forward Samuel Waardenburg (208-99, currently plays college basketball in the States) couldn't help the Miami, FL (1-4) in their game against the Virginia Tech in the NCAA. Waardenburg recorded 9 points, 6 rebounds and 3 assists. Buthis team was defeated 82-70 in Blacksburg by the Virginia Tech. Waardenburg has averaged so far 5.5ppg, 3.6rpg and 1.3apg. He used to play for the New Zealand U19 national team two years ago. #10. Forward Robert Loe (211-91, college: St.Louis, currently plays in Australia) is a teammate of previously mentioned Jarrod Kenny. However that was another game of his team in Australian NBL which brought him to that list. Loe couldn't help Cairns Taipans (4-19) in their game against Illawarra Hawks (11-12). He scored 6 points and blocked 2 blocks. The bottom-ranked Cairns Taipans were edged 82-81 in Gwynneville by the higher-ranked Illawarra Hawks (#6). Loe has averaged so far 7.3ppg, 4.8rpg and 1.2apg. He is an international player who is currently on the senior New Zealand National Team roster. #11. International forward Thomas Abercrombie (198-87, college: Washington St., currently plays in Australia) is a teammate of previously mentioned Finn Delany. He played also in the last Australian NBL game facing Corey Webster (above) in the other team. Abercrombie helped New Zealand Breakers win their game against the closely-ranked Bullets 109-96. He scored 7 points in 15 minutes. Abercrombie has averaged so far 9.2ppg and 5.0rpg in 22 games. He plays currently for the New Zealand national team. #12. Former U19 international guard Jayden Bezzant (188, currently plays in NCAA2) helped Northwest Nazarene University win their game against the Central Washington University 96-93 in the NCAA2 in Tuesday night's game. Bezzant scored 16 points. Bezzant has reliable stats this season: 11.8ppg, 1.9rpg and 2.4apg. He used to play for the New Zealand U19 national team back in 2015. #13. Former U19 international center Callum McRae (216-99, currently studies in the States), who plays in the NCAA couldn't help the Cal-Riverside (1-3) in their last game. 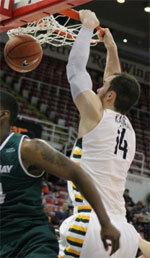 Despite McRae's good performance his team was badly defeated 82-64 at home by the University of California-Irvine. He had a double-double by scoring 10 points and getting the same number of rebounds in 24 minutes. McRae has averaged so far 6.4ppg and 3.9rpg in 22 games. He used to play for the New Zealand U19 national team two years ago. #14. International forward Daniel Fotu (201-99, is currently at the American university), who plays in the NCAA couldn't help the St.Mary's, CA (4-1) in their last game on Thursday. Despite Fotu's good performance his team was defeated 71-66 on their home court in Moraga by the Brigham Young University. He recorded 10 points and grabbed 6 rebounds. 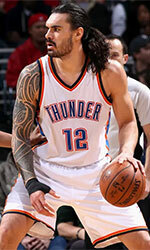 Fotu has averaged so far 4.0ppg and 3.4rpg. He plays currently for the New Zealand national team. #15. Former international forward Samuel Timmins (211-97, currently plays college basketball in the States) helped Washington win their game against the University of Oregon 61-56 in the NCAA last Thursday. He recorded 7 points. Timmins has averaged so far 2.2ppg and 2.6rpg. He used to play for the New Zealand national team two years ago. #1. Experienced Aron Baynes (208-C-86, college: Washington St., currently plays in NBA) led Boston Celtics to a victory against the Brooklyn Nets (28-25) 112-104 in the NBA last Monday. Baynes recorded 16 points, 6 rebounds and 3 blocks. The Boston Celtics have a solid 32-19 record this season. Baynes' overall stats this year are: 5.6ppg, 4.4rpg and 1.2apg. He has a dual citizenship: Australian and New Zealand. #2. Tony Tolovae (196-G-92, currently plays in Norway) was the major contributor in a Gimle BBK's victory against the league outsider Asker Aliens (3-17) 94-86 in the Norwegian BLNO last Saturday. Tolovae scored 20 points and grabbed 5 rebounds in 29 minutes. Gimle BBK Bergen (17-3) is placed second in the BLNO. It was his team's fourth consecutive victory in a row. It's Tolovae's first season with the team. He has individually a very good year with high stats. Tolovae averages: 16.1ppg, 5.2rpg, 3.1apg and 1.9spg in 18 games he played so far. He is another player who holds two passports: Australian and New Zealand. #3. Isaac Davidson (201-F, currently plays in NCAA2) could not help the Sonoma State University (5-6) in their last game on Thursday. Despite Davidson's very good performance his team was defeated 109-96 on the road by the California State Polytechnica Un. Pomona. He recorded 20 points and grabbed 6 rebounds (made all of his six free throws). This season Davidson has very high stats. He averages: 15.9ppg and 4.8rpg. #4. Izayah Mauriohooho-Le'afa (188-G-96, currently plays college basketball in the States) contributed to an easy victory against the Idaho State University (5-2) 74-58 in the NCAA in Thursday night's game. Mauriohooho-Le'afa scored 16 points in 33 minutes. The Sacramento State University has not so impressive 1-5 conference record this season. Mauriohooho-Le'afa has averaged so far 8.6ppg, 2.6rpg, 2.3apg and 1.1spg in 16 games. He is a naturalized American. Strangely Mauriohooho-Le'afa has never played in New Zealand. #5. Isaac Miller-Jose (203-F, currently plays in Canada) contributed to a Manitoba University's victory against the Wolfpack (6-11) 64-54 in the U Sports in Friday night's game. Miller-Jose recorded 10 points, 8 rebounds and 2 blocks in 19 minutes. The Manitoba University has 7-11 record this season. His team will play only one more game in the Regular Season. And that game will be critical. Miller-Jose has averaged so far 4.5ppg, 4.2rpg and 1.1bpg in 17 games. #6. Yanni Wetzell (208-F/C, currently studies in the States) was not able to help the Vanderbilt in their game against the The University of Oklahoma in the NCAA. Wetzell scored only 4 points and grabbed 4 rebounds. His team was crushed by 31 points 86-55. Wetzell has averaged so far 5.3ppg and 3.1rpg. #7. Jackson Stent (203-F-97, is currently at the American university) managed to help Houston Baptist University in a victory against the The University of Incarnate Word 96-92 in the NCAA in Wednesday night's game. He recorded only 4 points in 8 minutes on the court. Stent has averaged so far 3.9ppg and 1.4rpg in 19 games. #8. Takiula Fahrensohn (198-G, currently plays college basketball in the States) was not able to secure a victory for the Portland in their game against the Pepperdine University in the NCAA. He cannot count Thursday's game as one of the best ones. Fahrensohn scored only 3 points. His team was crushed by 25 points 83-58. This season Fahrensohn averages just 1.3ppg. #9. Quintin Bailey (201-F-97, college: Citrus JC, currently plays in NAIA) helped John Brown University win their game against the Southwestern Christian University crushing them 88-67 in the NAIA on Thursday night. He scored 8 points and grabbed 5 rebounds in 19 minutes. Bailey has averaged so far 5.1ppg and 3.3rpg in 16 games. #10. Corey Le'Aupepe (198-F, currently plays in NAIA) helped Menlo College win their game against the The Master's College, CA 93-81 in the NAIA last Thursday. He scored 6 points in only 11 minutes. Le'Aupepe has averaged so far 5.1ppg and 2.4rpg in 16 games.